East Village Association | West Town Chicago: Will Polish Triangle shape up? Will Polish Triangle shape up? 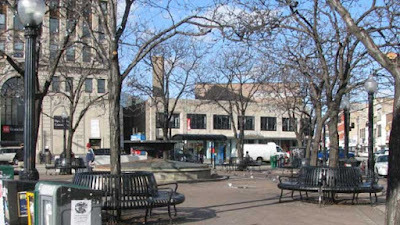 The city and CTA budgets, both stretched thin, would play key roles in transforming the Polish Triangle park at Milwaukee, Division and Ashland, according to a new report. But "Placemaking at the Polish Triangle," released by the Metropolitan Planning Council, also recommends a host of modest changes to what was described as "one of the most unsatisfying places" in the tax-funded Wicker Park Bucktown (WPB) business district. "Most do not want the Triangle to change dramatically, but think that small changes will make a big impact on the plaza," the planning report states. Karin Sommer, the council's Placemaking Chicago project manager, and Jamie Simone from WPB will present the report at 7 p.m. Tuesday, Sept. 7 at the Happy Village, 1059 N. Wolcott. Both Sommer and Simone are on the 19-member steering committee charged with following through on Polish Triangle plans. This is the East Village Association's monthly membership meeting, one day later than its usual date, which would fall on Labor Day. An upgrade to federal standards for accessible design. A rain canopy for both staircases. More lighting in and around the station. An "Adopt-a-Station" sponsor to commission artwork or plan station improvements. A decorative winter cover for the fountain. The CTA station at Division is one of the Blue Line's busiest, the report states, with 5,000 people using the station daily and more than 50,000 weekday riders traveling its three connecting bus lines. Residents gave planners specific ideas on making road crossings safer, from bumping out parking lanes to closing off Milwaukee Avenue as a mall. The report says a city study of traffic and pedestrian use would be the first step in carrying out these ideas. Police patrols. Beat cops would provide "stricter traffic enforcement." Trash pickup. "A casual observer will note there is much evidence of alcohol consumption on the Triangle," the report observes dryly. Landscaping. The city and WPB could quickly add pedestrian-friendly flowers, plants or grass. Activities. Art installations, farmer's markets, an information kiosk and a bicycle station are a few of the suggestions. The report publishes several architects' designs for the space. Scott Rappe and Norsman Architects submitted separate designs for a café and performance stage, while Hoerr Schaudt proposed a granite walkway, trees and a soundproofing berm. The study claims that the business district, Chamber of Commerce and 1st Ward office can encourage building owners to broaden the mix of stores, but notes objections in 1997 to a single-story convenience-store plan for the still-vacant Pizza Hut property at 1601 W. Division. New buildings should be "the same height or taller" than the existing storefronts, the study says, arguing that CTA traffic made off-street parking "inappropriate." It also advocates a zoning change to keep banks from clustering nearby. An online survey last year took suggestions on this site and elsewhere, and 57 people joined a social network to chat up the Triangle. A storefront open house took more suggestions, and displayed sketches from local architects. About 500 people an hour travel through the Triangle, according to the planners' count, and 700 during the morning and afternoon rush hours. But most simply pass through or wait for a bus. Transients and pigeons, the report said, "were a common source of complaints among survey respondents."